It’s friendly, it’s fun, and it keeps you fit! Why not give bowls a try? Bowling at Kingsland Bowling Club is a sociable ‘Sport for All’ where you can meet new friends, take gentle exercise, and enjoy the great outdoors of rural Herefordshire. Come along and enjoy our social atmosphere and our modern licensed facilities; we are an active, mixed club catering for all age groups. We organise a full programme of bowling and social events, as well as winter get-togethers and suppers. Be part of a local success story in a beautiful village setting! You can play sport and enjoy our activities through the year. Coaching is available for newcomers – the best experience though is simply to play bowls regularly – develop your own unique style. Bowls of many sizes are available for new members to borrow. You can bowl on the county standard green, with opportunities to play at higher levels in competitions and county games. Many club fixtures take place, home and away, during the season, including matches in Herefordshire, Worcestershire and Powys. Our club knock-out competitions go on through the bowling season, which runs from mid-April to mid-September. One-day competitions are great fun on summer weekends. We also take part in the competitive Herefordshire Men’s League on Wednesday evenings. Join us, and as a member you will have access to the green and clubhouse at all times. You can play bowls from 10 am on any day when there is no scheduled fixture – or you can just sit, socialise and have a coffee. from 6.30 pm; this is our main club night through the bowling season. Take a look at our excellent clubhouse and bowling facilities – and discover our well-hidden secret in the heart of Kingsland village. 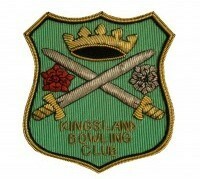 Contact our Kingsland Bowling Club committee members through our 'Contact Page' on this website.